Do you remember, we once shared with you tips and tricks on how to incorporate western wedding ideas into traditional Indian weddings. Contemplating on that thought we stumbled upon this classic inclusion of lavender into weddings. This also takes us back to when we put together a guide on how to infuse flowers like, marigold and orchids at your wedding. Lavender just like marigold is considered to be a symbol of love and devotion and is said to spread good luck in the atmosphere. The calming properties of this flower are instantly attractive, not to mention the classy look it can create no matter where it is placed. With anything that takes décor or wedding ideas up a notch, we’re in for it. So, this week lavender wedding ideas is what has caught our eyes and minds. From your wedding invites to your bridal outfits and footwear, here are some stunning ideas on how to incorporate lavender into your wedding. Tie in a couple of sprigs or send a whole bouquet that your attendees can place in their vase with your invites. If sending in real flowers is too costly, get the design printed on your wedding invitations. Wedding toss is again a concept of the west, but is a great inclusion in Indian weddings. You can have your guests throw in some love and luck at you with these lavender wedding toss either when you make a grand entry at your reception or an exit. Naked cakes, white cakes or lace cakes, throw in some sprigs of lavender on your wedding cake and you have a classy, yummy creation that waits to kick start your wedding celebration. A lot can be done and explored with lavender wedding décor. Using these delicately gorgeous sprigs, along with dainty baby’s breath flowers can create a beautiful chandelier, dress up your chair, fill up mason jars and for aisle or table décor. They also can be used to create stunning candle stand décor. And, who can forget the wedding car that your arrive in. 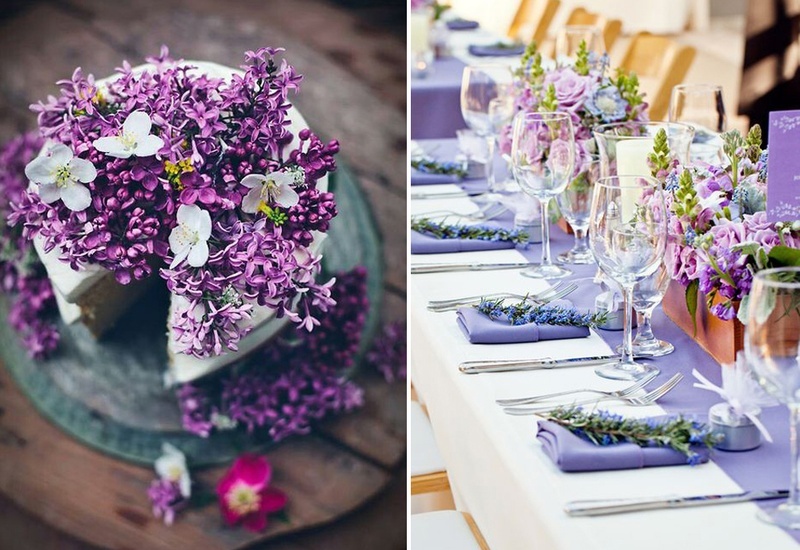 If you’re planning to have a sit-down dinner, think white table covers teamed with purple coloured runners and napkins with lavender sprig additions. If having an outdoor dinner setting, keep it natural with brown tables covered with jute and lace runners and of course lavender sprig additions to the napkins and centrepieces. Wedding table settings are incomplete without attractive centrepieces. It goes without saying that lavender sprigs will be an addition, but the trick here is to use unique vases and containers in which the sprigs get placed. From rustic kettles, unique shaped bottles, glasses, wooden boxes and candles, we’ve got it all here. Give your guests a unique treat with edible lavender sprigs. What better way to thank your guests than give away something useful and natural. If you’re an offbeat brides then lavender bridal wear are sure to interest you. For the traditional brides, we have cocktail wear and pre-wedding bridal dress suggestions too. Have a lookie!